Yes, ProjectWA is about connecting history and place. For five Lopez Island Middle School students, their teacher, and me, it’s been about so much more. Fundamentally, ProjectWA has been about connecting people. Anna, Ava, Mallory, Sonnette and Shayna have made many connections this semester: with historical figures, with preservation advocates, and with each other. Today, they connected with the 4th Grade Lopez Elementary Social Studies class. As their final ProjectWA assignment, our students were to write a blog post on one of this year’s Most Endangered Historic Properties. They learned quite a bit in the process: different approaches to research, how to interview an expert, and how to write a compelling call-to-action. The final articles are great. Mr. Rovente and I wanted the kids to go a step further – by turning those written works into presentations. 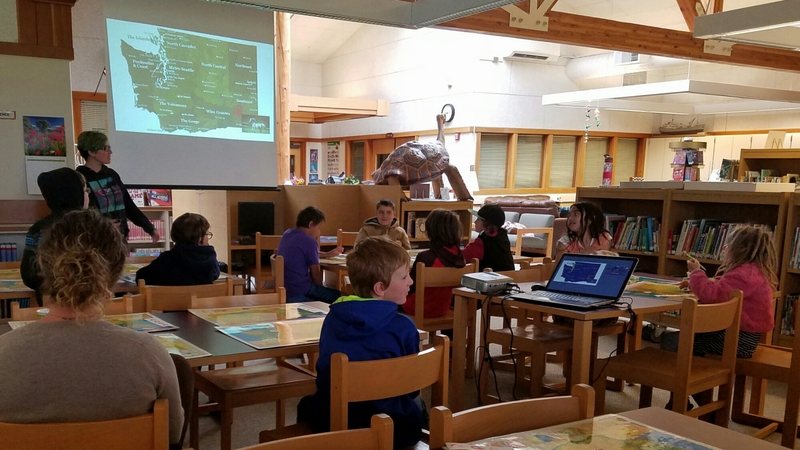 Lori Swanson, the Lopez Island Elementary social studies teacher, agreed to provide the audience for those presentations: twenty fourth-graders, whose final topic of the year is Washington State History. It was gratifying to watch the ProjectWA students become the teachers. The fourth graders were engaged throughout, and their questions for the middle schoolers were great. 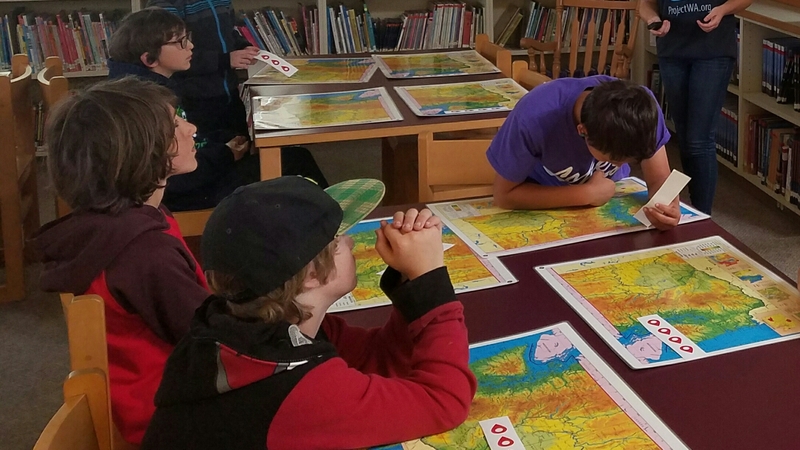 After every presentation, the younger kids got a chance to connect history and place the old-fashion way – with stickers and laminated maps of Washington State. Apps are cool, but stickers make everything more fun. With the student presentations complete, this semester’s ProjectWA class has come to an end. Now it’s time for me to go to school. For the next two months, my family and I will travel all around Washington State, checking out as many of the students’ app locations as possible. 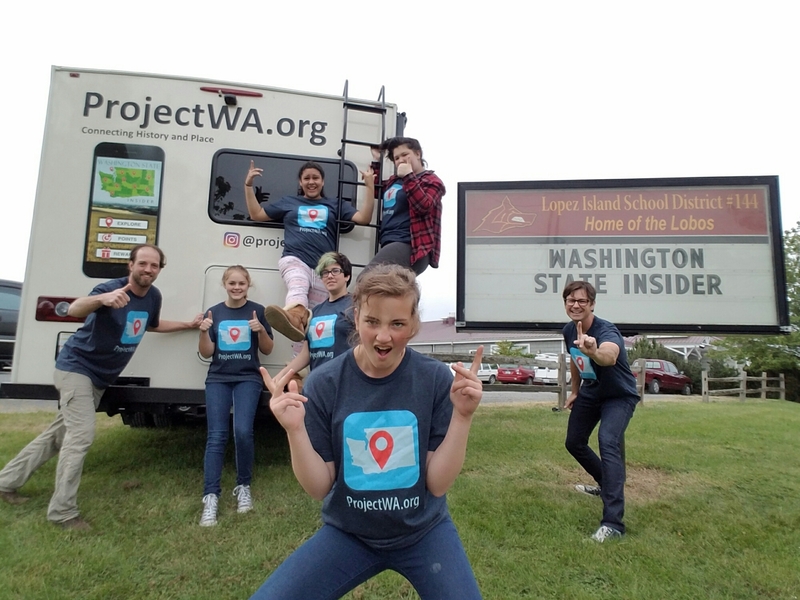 We’re also in search of other historic places, so we’re inviting people to send us suggested locations for us to research and then incorporate into the Washington State Insider app. I’m incredibly proud of what Anna, Ava, Mallory, Shayna and Sonnette accomplished this semester. I’d like to thank them – and their awesome teacher, Anthony Rovente, for taking on something that had never been done before. We all learned a ton. I know there’s a lot more to learn. Last week I paid a visit to the Washington State History Museum in Tacoma to give Erich Ebel a preview of the Washington State Insider app, which is set to launch by mid-June. Erich is the Marketing and Communications Director for the Washington State Historical Society, who manages the History Museum. They have agreed to give discounted admission to Washington State Insider app users who have collected points by visiting historic places around the state. Museums of all sizes are critical to reminding us of our history. If our cultural heritage is to be preserved, though, we need more than museums to curb the advances of shorter-term commercial interests that can be antithetical to historic preservation. In Woodinville, the City Council wants to tear down the town’s original schoolhouse to make room for a parking garage. In Kent, the last barn standing – representing the area’s agricultural roots – will likely be torn down if the City Council’s current plan to widen the Green River is implemented. During my trip last week I visited both the Woodinville Schoolhouse and the Dvorak Barn in Kent. Losing them would be a massive loss for each community. The groups fighting for the protection of these endangered properties are not necessarily advocating for keeping these old buildings in their original state. They recognize that economies, industries and demographics change. Instead of creating relics that have no apparent use in today’s communities, they would like to see these buildings preserved and used as community gathering places of some kind. History and modern life don’t have to be mutually exclusive. It is this integration of yesterday and today that is driving the development of the Washington State Insider app. 80% of Americans walk around with smartphones today. Let’s find a way to capitalize on that trend in a way that helps raise awareness of and preserves our cultural heritage. Over the next week, students from Lopez Island Middle School will be posting stories about the Most Endangered Properties of Washington State that they want to see preserved. Those places, along with nearly 70 other locations around the state, will also be found in the Washington State Insider app, available for iPhones and Android devices.